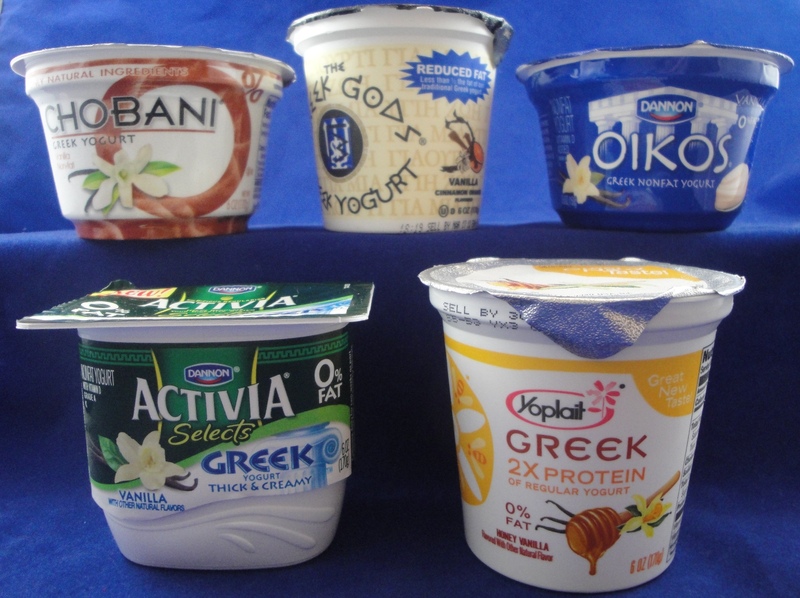 Did you know that there are at least 63 different varieties of yogurt at your neighborhood grocery store? Well, there are. I know this because I counted them. No, I am not a yogurt researcher, nor am I one of those strange men who like to hang out in supermarkets for hours on end. I just happened to spend an hour and a half yogurt-gazing at the local store with my wife recently because that’s where they told us to go if we wanted to vote early. Sue and I figured if we did our patriotic duty ahead of schedule we’d miss the big lines on Super Duper Tuesday. Ha! The voting line at the grocery store snaked from the pharmacy, through the book aisle, down the cheese section, across the milk and eggs, and all the way down the 63 varieties of yogurt. Hence the ad hoc study of the bacterially fermented dairy products. I’ll also bet you didn’t know that there are at least a dozen types of Greek yogurt, whatever that is. I immediately assumed that Greek yogurt was an economically troubled brand of yogurt requiring a financial bailout from all the other European Union yogurts, but, no, Sue said it has more to do with how it’s strained for whey content. Oh. That got me wondering what exactly whey is, but I’ll leave that for another column. Anyway, although this particular lesson in civic participation was mind-numbing for the most part, it did give the wife and me some time to get reacquainted without two teenagers constantly yelling, screaming, demanding money, or insisting on being ferried from one end of town to the other every twenty minutes or so. I was surprised to learn that Sue is now teaching herself yoga and is approximately a quarter of the way to obtaining her master’s degree in business administration. Man, we have to talk more. So, yes, we considered our voting experience more like a date night with ballots and photo IDs. As we waited our turn, my mind meandered a bit. I noticed a sign way at the front of the line indicating that you could pay your utility bills and purchase money orders here, and I was seized with a temporary panic that perhaps we were in the wrong line. The terror subsided when I saw that nobody else in our eternal cue was clutching utility bills. Besides, I’d never heard of an hour-and-a-half wait to pay the light bill, so I breathed easy. By the time we had advanced through the cheese section to the book aisle, I’d begun to seriously consider the “one vote doesn’t really matter” excuse for bailing out, but Sue would have none of it. Anyway, we’d already put in a good hour, and we could actually see the voting booths now. It was about this time, as we inched through the pharmacy and within sight of actual, real-life volunteers at the actual, real-life voting tables, that I concocted the concept of Vote ’n Tote. If you’ve visited a major, heinously overcrowded amusement park recently (I won’t name names, but the one I have in mind begins with an “S” and ends in “ix Flags”), then you’ve likely had experience with the infamous Flash Pass. 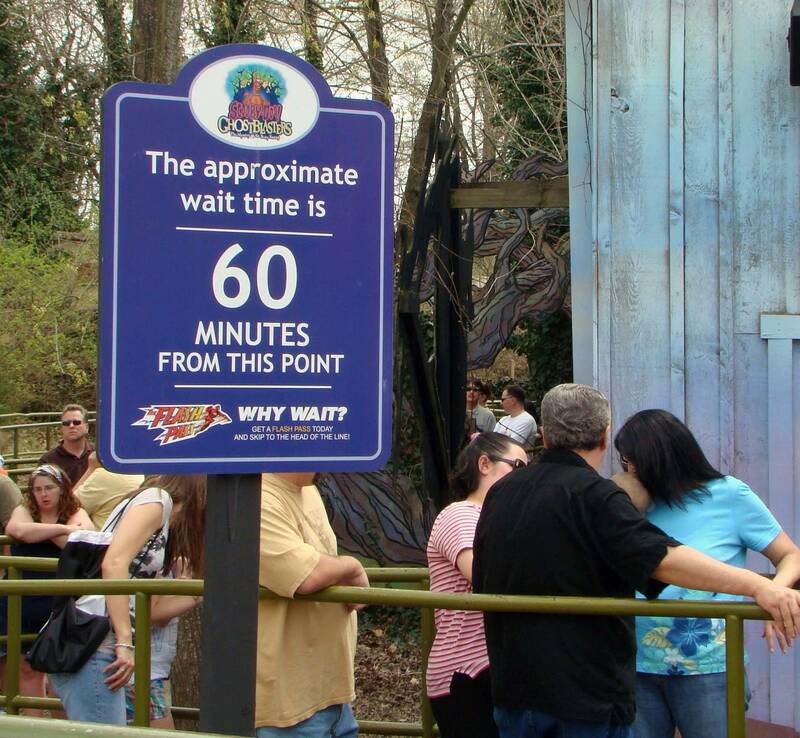 For serious extra money, this electronic doodad actually lets you cut in line ahead of the amusement park riff raff. How apple pie, capitalist American is that? You got the dough, you get to go. Voting, also as American as pie and guns and freedom and liberty, would be all the more red, white, and blue if you could move to the front of the line by way of the ol’ green. Don’t you think? Say you buy $30 worth of groceries, you get to jump in front of 30 non-buying voters. Forty bucks of foodstuffs gets you 40 people ahead, and so on. You shell out a couple hundred and you go straight to the front of the line—and you get to vote twice. Or something like that. Vote ’n’ Tote. Of course, this works only if you vote at the grocery store. If the polls in your neighborhood are, say, at the hospital, you may have to undergo surgery or get a flu shot to avoid the lines. Could call it Election Injection. Antidote Vote? Hmm. Now, this concept may not work at all at some polling stations. 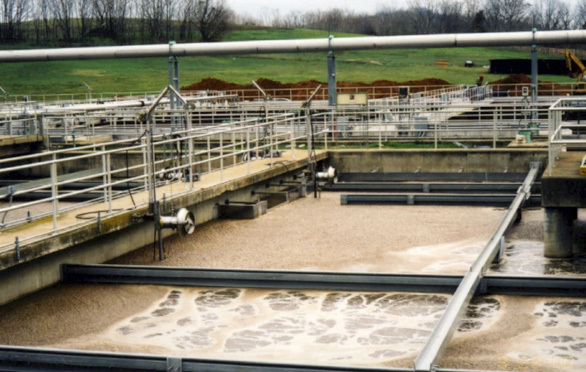 For example, at the sewage treatment plant. Cast ’n’ Cra— naah. I’m not touching that one. Actually, I’m not aware of any voting centers ever being set up in sewage treatment plants, but it does seem quite appropriate somehow, given the tenor of politics these days. ← Yee Haw! Texas Done Done ‘Er Agin! Based on your detailed description of the environs, it would appear that you voted at the Randall’s on S. MoPac and William Cannon. 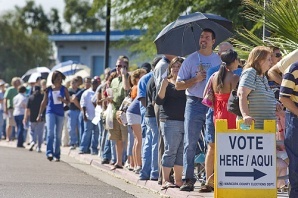 I know this because I too stood in line to early-vote there, and on my visit, the wait was over two hours! Fortunately, I had my trusted iPod Touch with me, along with a fresh copy of the Statesman. So, as I read about Ron Howard being in town to film a documentary about F1 (you going? ), I was able to enjoy some music. A bit too much, as some of the folks in my vicinity may have observed, because I tend to dance (move? tap? vibrate? pulse?) without realizing it. That iPod thing is just so …insidious, that one forgets that one’s neighbors in line cannot also hear Katrina and The Waves singing “Walking on Sunshine”. As you may recall, it’s quite a bouncy tune (especially at full blast), and as I looked up from my paper, I noticed people noticing me! I try to stay as innocuous as possible at all times (by nature), so I turned off the traitorous device. Thanks, RB. I’m sure eventually there will be some sort of voting app so all this will be ancient history.